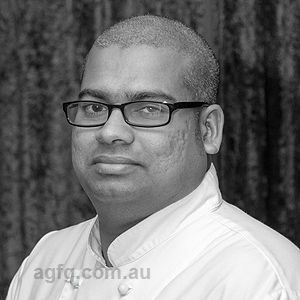 History: After completing a degree in Hotel Management in India, Boby worked in hotels in Goa and discovered his passion for food. Boby then transferred to the kitchen where he started his apprenticeship. 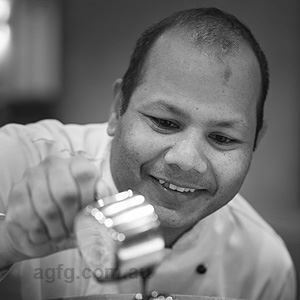 After 4 years in the kitchens of some of the finest hotels in Goa and Hyderabad where he worked under the famous Indian chefs the Qureshi Brothers, Boby then moved to Newcastle upon Tyne where he worked at St James Park (Newcastle United Football Club) and also for the Millennium Copthorne Group of Hotels where Boby worked with some great German chefs who taught him traditional recipes straight from their grandmothers recipe books. He then took a position as Sous Chef working with Dave Kennedy at the Black Toad Restaurant in Newcastle. After that he headed south to London where he headed kitchens for the Spirit Pub Company working in some of the finest gastropubs in London. 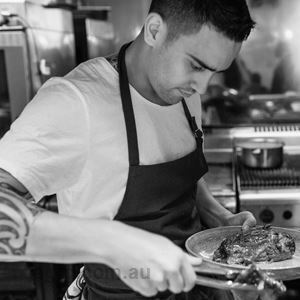 Needing to move back to a warmer climate, Boby accepted a position at the New Norcia Hotel where he was Head Chef. After gaining his permanent residency in 2011, Boby took over the reigns at the Rhein Donau Club in Myaree, where he has transferred a quiet club into a veritable full time Oktoberfest in the suburbs of Perth. 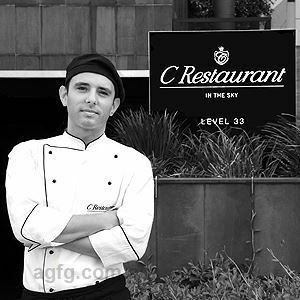 It was a pure accident that I became a chef, I was working at the Sun Village in Goa as a trainee manager and I got friendly with the chefs, I was always in awe of their creativity and wanted to do the same. 17 years later I've taken my wife and children around the world with a trade that I love. Free-flowing fusion, obviously I have a lot of influences, Indian, German, Eastern and Western European to name but a few. London is such a cultural melting pot and I worked with chefs from all over the world. I tried to learn as much as I could from everyone I met. Fusion only can work properly if you have a strong foundation in each cuisine involved. Obviously it's German, before meeting the German Chef's in Newcastle I had a huge exposure to German food and culture in India. German missionaries came to my home town and took care of the local children. I grew up eating Sauerkraut on some days and my mum's curry on the others. I also like to use an element of French techniques in my dishes and I also love the British Gastropub style. All in all I want to make sure that my dished have that right balance of being authentic, filling and tasty with a modern edge. I am pedantic about finding the best produce and knowing all about where it came from, how it was grown, what it was fed etc. I am constantly quizzing all of my suppliers as to the provenance of the produce that they supply me, having set these expectations I know that the produce that I am offered is always the freshest and of the highest quality. I will always go with a West Australian product over anything imported. Having worked all over the world I can safely say that WA produces some of the best produce in the world. It makes my decisions so much easier when I go to market. Wolfgang Puck and Grant Achatz. The Rhein Donau Club is like a big extended family and it is so rewarding to make my customers happy while being creative at the same time. It is hard to keep a crowd happy when they are eating at your restaurant 2 or 3 times a week, so variety is the key. I have my classic staples on the menu, but my specials menu is just as extensive and I like to cook what is in season at the time. Thyme.. It's my favourite herb. I try and use it wherever I can. The other ingredient I couldn't live without is Duck fat. In one of the Gastropubs I worked in in London there was turtle on the menu… I don't know whether you would get away with cooking it in Australia! Eisbein- Roasted Pork Hock… It's the perfect fuel for making it through a full day of Oktoberfest activities! When the hour calls for beer and bratwurst, take to Rhein Donau in Melville. 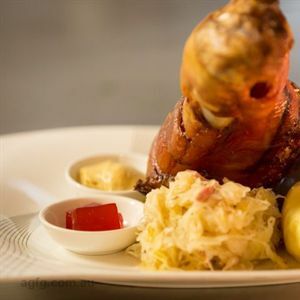 One of a select number of German restaurants in Perth, this lively venue boasts a spacious setting, often abuzz with crowds enjoying the regular events. Like a traditional bier hall, Rhein Donau’s separate sections are all decked out with warm wood and long communal tables; enjoy an evening of fun in the outdoor biergarten with or take straight to the main restaurant to browse a menu of German specialties and globally inspired fare. Traditional mains may include eisbein – a tenderly cooked pork hock with sauerkraut, Granny Smith apple mash and piquant mustard sauce – with international dishes featuring the likes of oven baked salmon fillet, served with Royal Blue mash, buttered broccoli and tropical fruit salsa.